Hike NC is back! The hiking program Blue Cross NC launched last fall is back with trails and hikes designed to get everyone moving in NC’s beautiful nature parks. Many of the one-mile to three-mile hikes are on easy terrain that beginners can conquer. With nearly 70 hikes statewide this fall, Hike NC has options for every skill level. We encourage more experienced hikers to join us on a hike in parks across the state. Slower hikers may need some extra support, and that’s okay, our hike leaders are there to support you on the trail with tips and encouragement. If you’ve been hesitant to head into the woods alone — or worse, you’ve gone out with a group and been left behind — Hike NC is where you need to be. 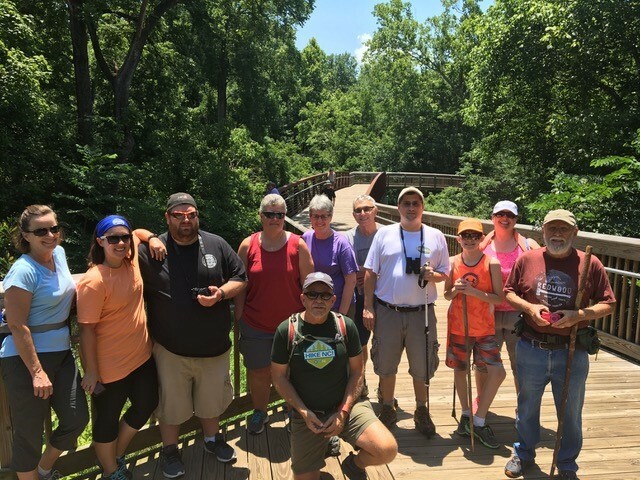 The North Carolina Recreation and Park Association, one of our Hike NC partners, has rallied its members to host hikes from the Oak Island coast to the beautiful mountain town of Asheville. Many of these hikes are in neighborhood municipal parks. You don’t need special gear to explore these hikes; whatever you have in your closet should do just fine. Our hikes are on natural surface trails, so we recommend sneakers or closed-toe shoes. High-tech, breathable (and often pricey) pants and tops intended for long days on the trail aren’t required. And, again because the hikes are short, you won’t need a fancy pack to haul a bunch of extra clothes, gear or food. Our experienced guides recommend that you always bring water on a hike. Even on a cool fall day, you can still get dehydrated. Think of it as training for the longer hikes you’ll eventually be taking! We’ve also got incentives – who doesn’t like free stuff? Join us and we’ll hook you up with some swag that you can use on your next hike. We’ve got mini flashlights (good to have if lose track of time and hike into the dark) and collapsible water bottles. Why Hike with Hike NC? For one, you’ll burn calories. Your legs may be a little sore the morning after, but the hike will fly by. You’ll strike up a conversation with fellow newbies and you’ll likely be smitten by the natural world around you. You’ll be free of the stress of being “connected” to electronic devices and hear nature calling you to smell more than just the roses. With the leaves changing and the guaranteed cooler temperatures just around the corner, we hope you will get excited about spending time on these North Carolina trails. To find your perfect day adventure, visit GoHikeNC.com.